E.g: You buy one suit nova with three nodes, main node works fine, but other two nodes cannot connect to main node. 1. We suggest the distance between two nodes no more than two walls, if the position is not properly, please adjust the place and angle of nova. 3. If two nodes cannot connect to main node still, please find a tool to hold on reset button for 20s, when lights turn to solid white then you can release it. 4. 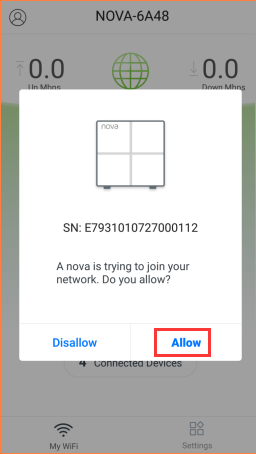 Then lights turn to blinking blue, open APP and check whether it will pop a window that a new nova unit is joining the current network system. Tap “Allow”.